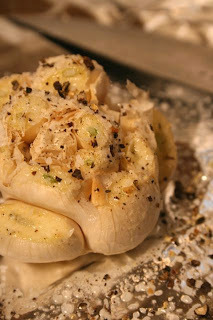 There are certain ingredients that you just can't live without...roasted garlic is one for me. 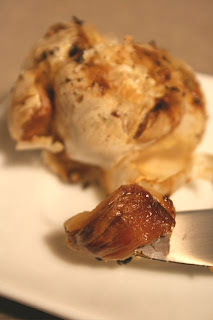 I love roasted garlic in almost all of my savory recipes or even by itself. There is nothing better than smearing a freshly roasted clove of garlic on a warm piece of freshly baked bread! It is one of the easiest things to do and it just makes garlic even better...if that was possible. 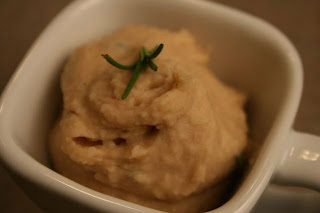 The latest bulb of garlic that I roasted went mostly towards a creamy white bean dip/spread I made. This dip/spread was mild and creamy with a slight tang from the balsamic vinegar. I like to use this as dip or a spread or I put it on my salads instead of dressing! Remove outer paper from garlic, but leave the head in together. Slice off the top to expose the garlic. Spray with cooking spray. Sprinkle with salt and pepper. Wrap in aluminum foil and cook for 45 minutes to 1 hour (until soft). Veggiegirl, I totally read you mind! I absolutely love garlic! Oh, and I think you rock too! Lyrically Speaking, I am so glad you stopped by! Thank you for linking to me too! I really appreciate it! Us dairy free people have to stick together! I love your blog title and creative layout :o). seriously. i wouldn't want to live in a world without garlic and roasted garlic is just the best. i've been getting sacks of local heirloom garlic and roasting it up--it's a dream come true. Okay, I admit that does look better than the jar garlic I usually buy. It may be time to invest in a bulb. The little vegan, thank you! I like your site too! Emilie, I know. I may eat way too much of it, but it is just so good! Aisa, I really is so easy and so good! I used to do the bottled thing too until I realized that I use it more often and in better ways because I know I need to use it up!